NP (Rift Valley Fever Virus) ELISA Development Kit contains the key components required for the quantitative analysis of NP (Rift Valley Fever Virus) concentrations in cell culture supernatants and serum within the range of 1 - 64 ng/mL in a sandwich ELISA format. The components supplied in this kit are sufficient to assay NP (Rift Valley Fever Virus) in five 96-well ELISA plates. Capture Antibody: 100 μL of 1 mg/mL anti-NP (Rift Valley Fever Virus) monoclonal antibody. 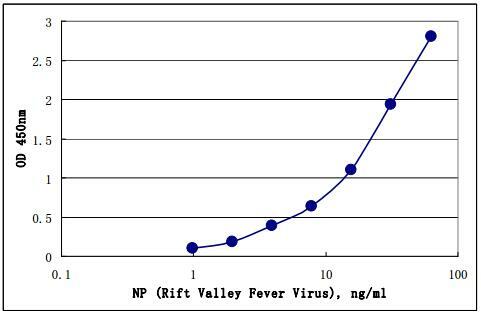 NP (Rift Valley Fever Virus) Standard: 50 μL of 50 μg/mL recombinant NP (Rift Valley Fever Virus). Detection Antibody: 50 μL of biotinylated monoclonal antibody against to NP (Rift Valley Fever Virus). Streptavidin-HRP Conjugate: 50 μL of HRP- conjugated streptavidin. Have you cited DEIABL24 in a publication? Let us know and earn a reward for your research.